TL and I wanted to do one special dinner while we were in Berlin. Our last night there, we ate at the TV Tower, or The Fernsehturm. 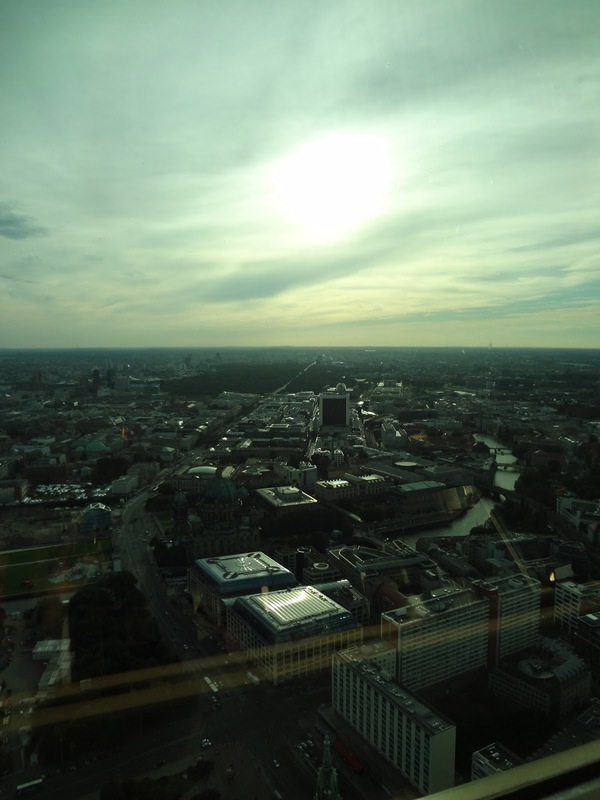 It's a tall tower that slowly spins to give you 360 degree views of Berlin while you eat dinner... you're also almost 800 feet in the air! TL and I are usually quick eaters. Not this time. It took us more than 2.5 hours to eat dinner, dessert, and enjoy our coffee. We watched the sun slowly go down. It was an amazing experience. We had a very nice waiter. If you go, be sure to make reservations at least 2-3 days in advance. Also tell them you would like a seat with views. I had one of those moments where I was overwhelmed with happiness. I felt extremely blessed to be there with TL enjoying the views in a country we love so much, Germany! It'll be a moment I know I want to revisit again in my life. The food is okay - we really liked the dessert and thought the views were totally worth it. It was a little expensive, but not as bad as we thought. We took our sweet time figuring out what we wanted to eat. Our waiter didn't mind! I think I would have to pass on such an experience! I am terribly afraid of heights. But it does look amazing! What a beautiful day, too!! Your drink looks delicious!! And I love spending a long time eating, it makes everything taste THAT much better! So cool!! :) I've been drooling over all your vacation pics!! Tracy, lately when I stop by for a visit here I have the wonderful experience of traveling without the cost. tee hee. I love seeing your photos of distant lands and BTW---you guys are too cute. I will never be looking out of that window because I am much too neurotic about heights, so I appreciate the view from your blog. Beautiful pictures! I loved Berlin. Love seeing all of your travels. I love eating in high rise places like that. Fred, not so much. Love this! Very cool experience indeed. I think it's fun to have a nicer dinner on your last night in a vacation spot. I have always wanted to go to Germany and Turkey...both of which I can now stalk from your blog..haha.. :) Eric and I haven't really decided on a honeymoon, but we're thinking beach. BUT, we're also thinking Europe for a one year anniversary trip! Beautiful! And great weather to really enjoy the view! How unique! I love that it spins you to see all of the view! What a great meal too!